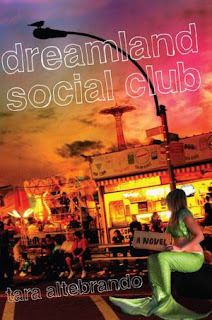 When Jane's maternal grandfather dies, the family inherits his old house on Coney Island. Grandpa was some sort of well-known character at Coney, but she never met him. Her mother, who died when Jane was six years old, never felt any reason to bring her home to meet the family. So, the man and his whole Coney Island existence is a great unknown. But with Jane's father between jobs, they decide to live in the house for a year and this presents a unique opportunity to learn about her family roots. The community, with its mix of classy and shabby surprises them. And the house is a mirror of the neighborhood's oddness. There's old movies of Coney Island's past, a wooden horse chained to the radiator, an attic full of rescued landmarks of the long-gone attractions, and a basement full of her grandmother's exotic "bird-woman" costumes. It's a world full of more questions than answers, which frustrates Jane's attempts to learn more about her mother through the people who grew up with her. This wildly busy story is bursting with color and with subplots. The characters are vibrant and vivid. In short, there is never a dull moment. And, given the subject matter, the chaos of the plot is apropos for a story. However, I'm less of a fan of the dense writing style (and, in particular, of Altebrando's stylistic convention of putting two different voices of dialogue in the same paragraph). It's not an easy book to read at times, but it's certainly got depth and variety. Like the boardwalk, there's a little bit of everything here for most readers, but you'll enjoy the story most of all if if you like stories about carnivals and freak shows.